The holiday season brings an excess of indulging in celebratory food. For those coping with disordered eating and body image struggles, this can trigger significant anxiety. Disordered eating (and related issues like over exercising and laxative abuse) are typically associated with teenage girls, but can just as easily have a significant impact on middle-aged women and men. Adults with disordered eating (or full-blown eating disorders) may have suffered for years without diagnosis or treatment, received treatment when younger but relapsed or developed eating and body image issues as an adult. Research shows that in midlife, more than 50 percent of women are unhappy with their bodies and want to lose weight. Physical changes caused by pregnancy, menopause and a slowing metabolism make it far too easy to gain weight and frustratingly more difficult to lose it. These uncontrollable changes can be a significant trigger for someone already predisposed to having a negative self-image. The urge to control eating and exercise to an extreme can feel like a logical response when your body is no longer cooperating as it had been. Like teens, adult women and men (to a slightly lesser degree) are vulnerable to peer and media pressures to be thin, become muscular and fit into “ideal” size clothes. Now more than ever, advertising for weight loss and exercise products target midlife adults—an audience that has the most money to spend on reaching idolized physiques portrayed in less than realistic ways. 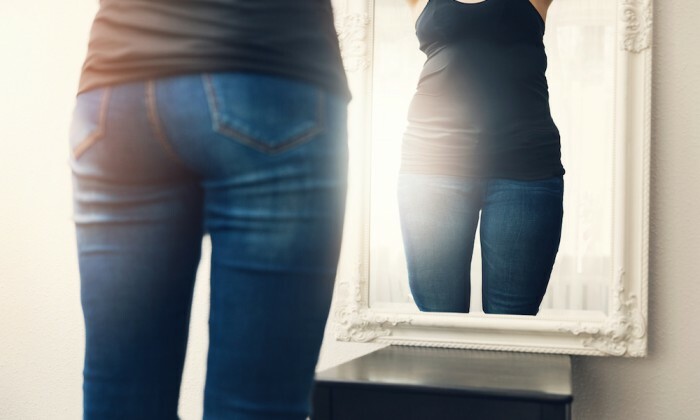 The greatest trigger for a distorted body image and disordered eating after adolescence is challenging life transitions—particularly those that cause a direct confrontation with aging or mortality. These include marital problems, separation or divorce, the death of a parent, becoming an empty nester, a child marrying, becoming a grandparent, menopause, retirement or general signs of aging. For women, problematic behaviors may include significantly restricting eating, over exercising or laxative abuse. Men are more likely to over exercise to lose fat and gain lean muscle, but can also engage in all the disordered behaviors that women display. Even though research demonstrates that up to one quarter of those with eating disorders are male, men are frequently not diagnosed or treated because cultural biases prevent them from seeking help (and doctors from recognizing a problem). Research identifies binge disorder as especially common amongst men. Sometimes eating disorders in older people go unnoticed because sufferers don’t become seriously underweight (and may even be overweight) and because adults are embarrassed to ask for help for what they consider to be a problem of a younger generation. Nonetheless, consistently depriving the body of nutrients can cause heart problems, bone loss and other stresses. It can be difficult to admit to needing help (or even know a problem exists), and it can also be a challenge to take the time to get treatment because life’s obligations get in the way of making health a priority. However, it is extremely important to not ignore signs of disordered eating, which also include low self-esteem, a distorted body image and anxiety or depression associated with food or appearances. It may also be important to seek professional help to learn how to develop a healthier relationship with food. Even for those who don’t believe they have a problem, it’s always good to surround yourself with those who aren’t self-critical, this time of year or any. It’s also helpful to reduce exposure to media and social media that glorifies thinness. The right size or shape should be the result of embracing an exercise program that focuses on health and fitness, rather than a perfect body.